Happy Hanukkah! The Jewish "Festival of Lights" comes early this year. (Blame the ancient Hebrew calendar for the annual confusion—it doesn&apos;t line up with our modern one.) Hanukkah is the time when Jews worldwide celebrate a miracle that supposedly happened at a temple in Jerusalem in the 2nd century B.C. Back then, a group of Jewish rebels called the Maccabees defeated the Greeks who had taken over the city. When they cleaned up the temple and rededicated the place to Judaism, they needed oil to burn in the lamps overnight. (For religious reasons, you were supposed to keep a lamp lit in a temple overnight.) They only had enough oil to burn for one night, but (here&apos;s the miracle) that little bit of oil burned for eight nights—long enough for them to get more oil, and keep things going. So that&apos;s why the holiday lasts for eight days. (Well, eight nights, technically, and seven days.) And why we light an eight-pronged candelabra called "the menorah," adding a new candle each night. And that&apos;s why, also, it seems like a good time to give thanks to some of the most notable Jews in hip-hop history. 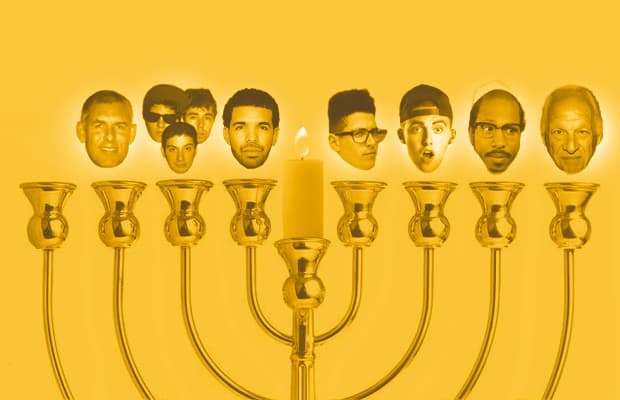 So sit back and light one (a candle) as we spin some records and the dreidel and celebrate the 8 Jews of Rap. As far as hip-hop pioneers go, Lyor Cohen stood alone. A towering but gawky Israeli—it was revealed in Dan Charnas&apos; expert history The Big Payback that DMC referred to him as a "girallama," a fantastical mix of a giraffe and a llama—he spent time in New York and LA, but his accent remained so strong, so strange that Arista&apos;s Ann Carli thought him handicapped upon first meeting him. But that was when Lyor was just Russell Simmons&apos; hard-nosed assistant at Rush Management in the mid-&apos;80s, before he grew into one of the more terrifying, brilliant and successful executives still around today. Running Def Jam Records for a decade (It was he who pushed Rick Rubin out of the label he&apos;d cofounded—"My Jews are fighting," Russell is reported to have quipped) he, perhaps more than anyone else, made hip-hop the dominant sound and culture of today. Throughout the &apos;90s, as Def Jam’s president, he signed Jay Z, the Ruff Ryders and Murder Inc, promptly pitting them against one another—his management strategy is a combination of Darwin, Macchiavelli and The Beastie Boys. Similarly, he’d shepherd the careers of Julie Greenwald, Todd Moscowitz, Chris Lighty and Kevin Liles, an incredible group of protegés who, excluding the late Lighty, remain deeply loyal to him. Even still, his legacy may be that of the man who brought hip-hop to a global audience: he partnered Run-DMC with Adidas; he branched out from an office in SoHo to outposts in Atlanta, Los Angeles, London, Germany and Tokyo. Under his watch, Def Jam merged with pop/rock label Island, putting acts like Fall Out Boy, Shania Twain and Bon Jovi under the same corporate umbrella as Ludacris, Beanie Sigel and Redman. He left for Warner in 2006 and having righted that ship, he&apos;s now building his own label with Moscowitz, 300 (named after the Spartans, unfortunately, not Chief Keef) and co-managing the careers of Rick Ross and others. There&apos;s always been that sticky rumor that Jews run the music industry, but really, it&apos;s just this one. Check back tomorrow to see our next great Jew of rap.